2017 Lexus GX 460 Luxury Review: The High Life? 2017 Lexus GX 460 Luxury: The High Life? Toyota’s eco-themed Prius hybrid is one side of its automotive lineup. 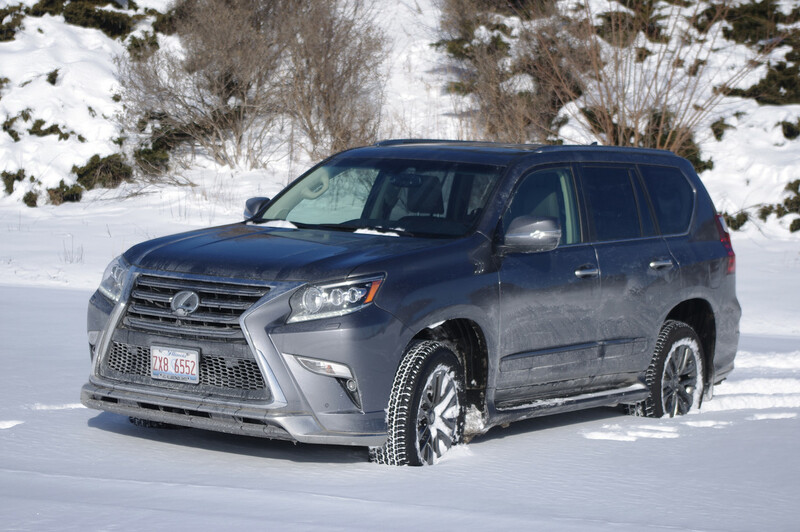 On the other, Toyota’s Lexus GX 460 Luxury is tall and not very thrifty. It’s a body-on-frame heavy-duty machine that tows or stows your gear in pampered comfort. Meanwhile, it guzzles premium fuel. We’re talking less than 14 mpg overall. This ravenous appetite might drive you to the poor house. There’s an incongruity. An eco light urges you to go easy on the long pedal. If you can afford the GX’s $70,000 entrance fee, you probably don’t need a thrift coach. Stepping up and into this machine is awkward. Its skimpy running boards are poor toeholds. Drivers, however, get help. A motorized steering wheel moves forward and the power seat slides back making room for your keister. Sit down, press start and the throne and direction finder return to your preferred positions. Vehicle height also is adjustable. You don’t have to rough it with stiff levers in order to perform off-road dirty work. Toggle switches let you electronically select four-wheel-drive high or low, lock the center differential, summon hill descent control or opt for an off-road crawl mode. 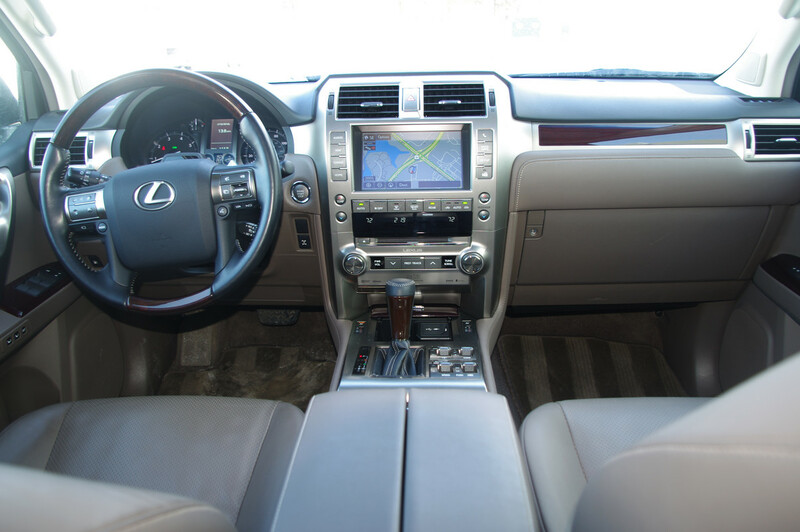 This Lexus’ cabin is plush, too. Mahogany wood-veneer inlays grace the steering wheel, door panels, dash and center console. You take command from a padded cell. You’ll notice a rubbery ride that disguises its humble conventional truck suspension. On secondary roads, the SUV tosses, bucks and thumps. Unpaved road prowess is good, however. Despite upscale interior trimmings, the GX sometimes looks low rent. For instance, the infotainment display icons were poached from a vintage Atari videogame. Some plastic pieces try but fail to look like metal. Soft interior “improvements” are contoured to fudge fit. The rear cargo cover has bra-like straps. These dangling strips affix it to the movable second-row seatbacks. The backdoor swings open like vintage Ford station wagon. Unlike the wagon-master Ford, it’s inconveniently hinged on the right. One must enter via the vehicle’s street side rather than curbside in tight parking situations. Load height is high. The transom-like rear window glass is nearly shoulder-height. Therefore, this portal taxes your spine. Perhaps GX owners pay others to heave and retrieve their gear. Stowage room, although nicely finished, is conflicted. If the third-row seat is raised, cargo space is ridiculously skimpy. The motorized split-seat third row, however, is ingenious. When the seat back rises, the bottom cushion moves forward. It’s pure wizardry but there’s nothing magical about the cramped kid-only seating. Due to this midsize vehicle’s truck-type driveline the aft compartment cannot offer a low minivan-like floor. In the go department, a capable 301-hp V-8 engine acts through a six-speed automatic transmission. Power delivery is adequate. 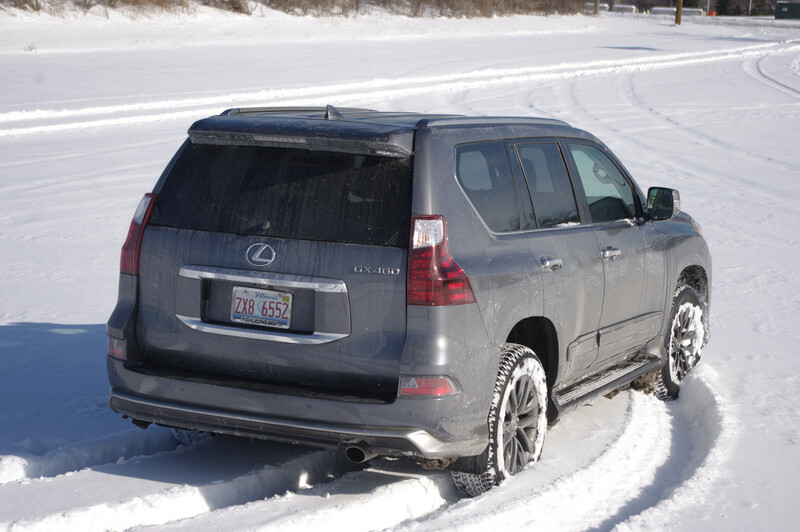 Lexus says there’s a healthy 6,500 lb towing cap. EPA fuel economy estimates are 15 city, 18 highway, 16 mpg combined. Handling is acceptable. The hydraulic power steering reminds you of a Detroit land yacht’s low-effort tiller. It is too light and vague. A slow steering ratio means you’re unlikely to tip it over in an emergency maneuver. A stability program helps, too. Lexus stares at the driver with infrared device called a driver attention monitor. A camera assembly atop the steering column examines the pilot’s eyes. If you nod off, it’s supposed to wake you. I didn’t test this feature. One reason for driving this rig is plowing through deep snow. The mechanical bits are up to the task, but the fancy alloy wheels become Ferris wheels of torture. Snow and ice cling to them causing severe wheel imbalance and Richter scale tremors through the body and steering system. I cleared crud from the wheels’ backsides in order to restore motoring composure. Lexus charges $69,920 to join the high life. That includes those fancy 18-inch wheels and various exterior garnishes ($1,425) and a driver support package that includes the driver attention monitor, dynamic radar cruise control and Mark Levinson audio ($4,340). REAL pimps need much bigger wheels and tires than those puny 18's. This is for poseur , faux , wanna-be pimps. And people who like to burn fuel.